Works by two Vermont artists are currently and coincidentally featured on the bottle labels of beverage companies based in Bridgewater Corners, Vt., and Miami, Fla. Retired Burlington architect Tom Cullins, who has embarked on a new career as a painter, received a commission from Long Trail Brewing to create an abstract design for the company's seasonal stout. And a recently established Miami firm asked Northeast Kingdom artist Lois Eby to produce a piece to brighten bottles of its spring water. Cullins likens his bold geometric composition to a target. He chose its four colors — black, brown, red and white — in response to Long Trail's suggestions for a palette it considered appropriate to its Imperial Stout. Cullins made three paintings for the company's consideration, and he agrees that the one selected was the best of the trio. The brewery explains on its website that "Cullins' dynamic use of color and space provides a warming visual that echoes the structured chaos of the malts and hops that create this dynamic brew." 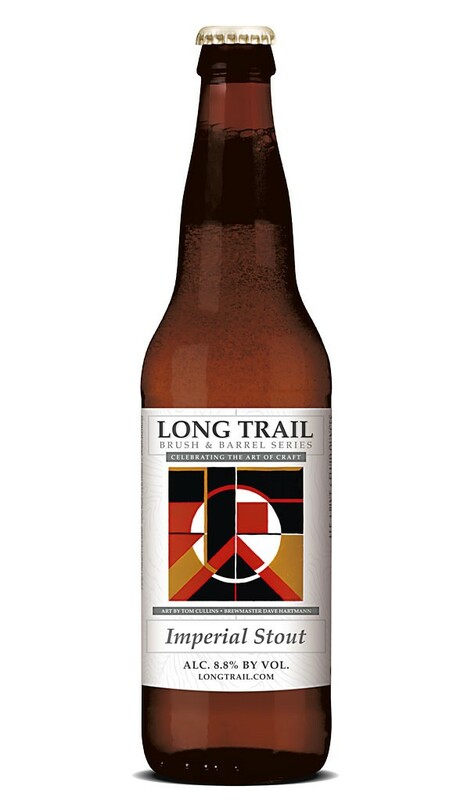 Long Trail's leadership specifically wanted an abstract work for bottles of Imperial Stout, notes marketing director Jed Nelson. He says the 25-year-old pioneer of Vermont craft brewing had previously used "traditional, bucolic" paintings by three Vermont artists — Jess Polanshek, Katharine Montstream and Carol Boucher — for bottles of its other limited-edition beers. "We thought it was a fitting way of cross-promoting some Vermont artists and our beers," Nelson says of Long Trail's initiative. These kinds of labels "also make a connection with the artistry of craft brewing." Owing to the small volume the brewery produced of each of the four beers bearing artsy labels, it's not possible to tell whether the bespoke branding has had an impact on sales, Nelson adds. But it will surely enhance the artists' visibility in Vermont and beyond. Each label bears the name of the painter who designed it. Artists receive other perks, as well. Cullins says Long Trail paid him a sum he prefers not to disclose for his acrylic-and-watercolor work — and he got a free case of Imperial Stout. 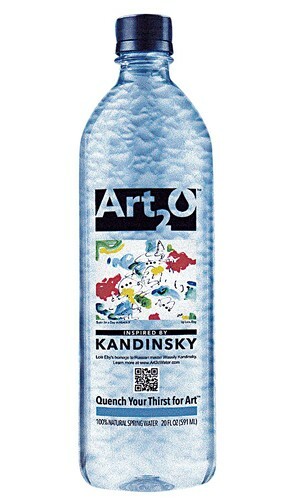 Eby received no direct remuneration for the label she made for Miami's Art2o. But company founder Claudia López did arrange for three of the Wolcott artist's paintings to be included in that city's "Art Basel" exhibition, which drew thousands of potential buyers during a five-day run that ended December 7. Labels commissioned by the water bottler bear not only the artist's name but also a code that, when scanned, links consumers to a website with information about the artist. "Art2o uses the labels of its bottles like a canvas to bring the talented work of amazing artists to new audiences who may otherwise never discover them," López says. "It's about creating a relationship between our customers and the art community." Eby's work came to the company's attention through a painting she consigned to a Boston public television station's fundraising auction. Because some of her pieces are clearly influenced by the early abstractions of Wassily Kandinsky (1866-1944), Art2o judged her mélange of inky squiggles and colorful splotches a fitting choice for inclusion in a series of labels through which contemporary painters pay homage to modern masters. 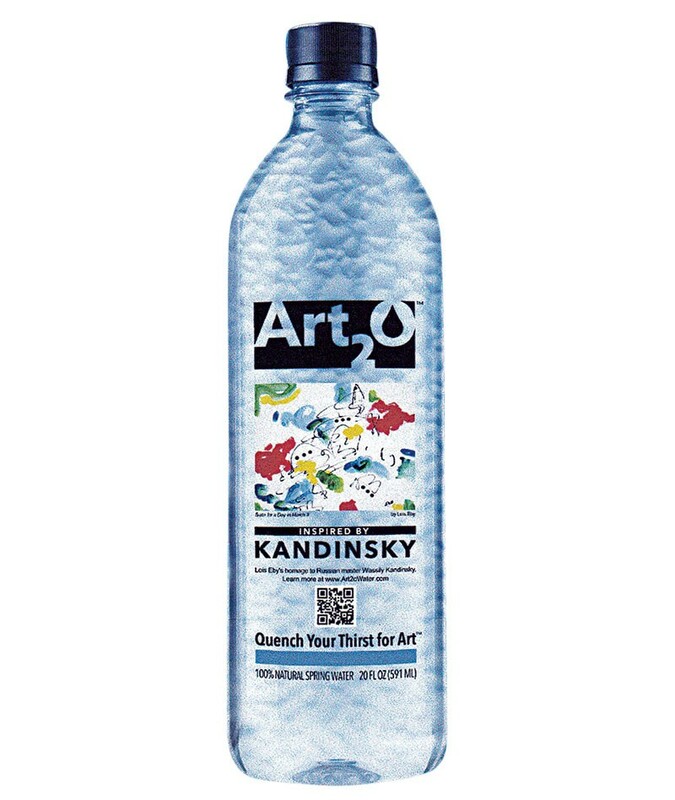 The distinctive styles of Frida Kahlo, Andy Warhol and Willem de Kooning inspired the other designs affixed to Art2o bottles. Eby says she became a Kandinsky fan in the 1980s — an era when she was growing restless with landscape painting. "I began to feel that the observational approach to nature was not the right approach for me," Eby recalls. "I wanted to work in a more creative way, as nature is creative. I wanted there to be motion and change in my art." Kandinsky supplied both sensations in works that blazed the path away from representation of the outside world and toward an art that springs from within. Cullins and Eby both say they're satisfied with their experiences producing work for private companies. Each artist also expresses slight reservations about being cast in that role. "I'd do it again," Cullins says, "as long as the request was for something related to the particular art I was doing at that time." He hastens to add, "I'm not a commercial artist." Eby, who's been married for 48 years to Vermont playwright David Budbill, likewise emphasizes her commitment to fine art. She adds, however, "It felt intriguing to be making art more available to people, to be getting out of the museums and into the streets." Plus, Eby says, "I like to make my work accessible in different settings, and Miami is certainly different from Vermont." The original print version of this article was headlined "Product Placement: Vermont Art Lands on Labels"
Tags: Visual Art, Art, artists, design, beer, Long Trail, Long Trail Brewing Co.